Around the turn of 1900 there were a number of fine mansions strung out along Hinckley Road, and two large ones in Higham Lane just around the corner - The Chase and the Clunes. The Chase is still with us but the rest have vanished. Listed in sequence along Hinckley Road were The Briars, Cecil House, Springfield House, Summer Hill House and the Poplars (a farm house). Briars Close stands in the grounds of what was once "the Briars". These houses can be described as minor country houses in today's terms and were the home of Nuneaton's top businessmen. The Chase occupied by James Knox of Haunchwood Brick & Tile fame who had nine sons. The Briars by Bertram Hardy who I guess was a director of a local business or had a private wealth of some sort as I cannot find his trade in the contemporary trade directories, so a bit of a shadowy figure at present. Cecil House by Walter James Yoxall of Cafe fame, Springfield House by Richard Clay, whose Clay family were big business people in Nuneaton. This was what happened to the Briars. 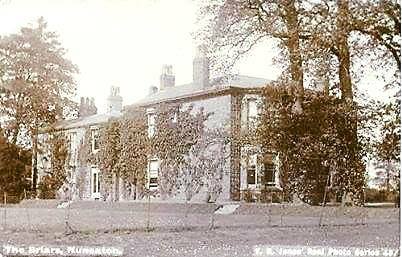 Bertram Hardy left Nuneaton before 1917 and the Briars was rented by a William Hill. Mr. Hill was a Durham mine owner and his grandaughter told me he purchased Stockingford Colliery (Drybread pit) from the Chayter family of Bishop Auckland about 1913 and despite the First World War with its voracious demand for coal it proved to be a bad investment. (geological problems). That's another story. Nevertheless my correspondent in Stratford Upon Avon who told me about her grandfather says the house called The Briars was where her mother lived at this time and she described it as flat fronted and 'ugly'. It did have nine bedrooms, three large downstairs family rooms, one divided by an arch with a curtain across, the usual other accommodation and what she described as a vast scullery. The grounds though were palatial. The Briars had a tennis lawn, croquet lawn, three green houses with vines, and a large kitchen garden. Also stabling for seven horses. 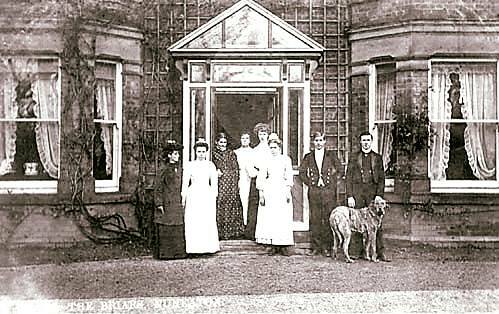 Around 1921 the family gave up the Briars and the governors of Nuneaton High School for Girls rented it as a residence for a number of young teachers on their staff who were single. An old lady who lives locally who went to the High School says they in turn left there in 1933, as necessity of having a crowd of young single lady teachers living together was deemed expensive, better they lived in the community. It did not find another occupant or a buyer and stood unoccupied for a time before it was knocked down and Briars Close built in its grounds. The first houses in Briars Close were built c. 1939 and the new development was stopped because of the emergency, and then completed just after the war. Here is a strange side note to the William Hill story. When he acquired Stockingford Colliery he brought some of his key Durham miners down with him. They were chosen because Mr. Hill had the idea of fielding a good cricket team when he moved to the Midlands. So his miners were selected because they were excellent cricketers!